The Subterranean termite is a serious economic timber pest causing millions of dollars in damage. It is estimated that more than 1 in 5 homes have been or will be attacked at sometime by these voracious little insects. The workers are by far the largest caste in the subterranean termite colony and the one that does the most damage; they are a creamy translucent color, soft bodied and carry out all the work in the nest, including constructing tunnels and gathering food(timber and other cellulose). 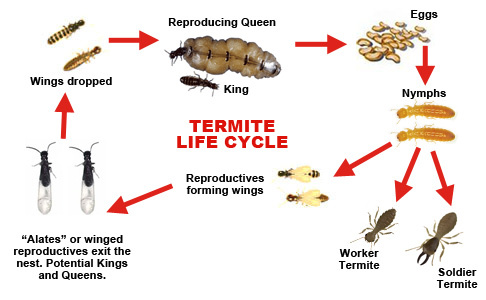 The Queen termite is an egg laying machine; her body is enormous compared to her off-spring; she can live more than 25 years and produce more than 2,000 eggs a day. If you are seeing a lot of small insects flying around in the spring or summer months, those would be termite swarmers. Swarmers generally occur during these months. The swarmers are called “alates”, they are poor fliers and are swept along by the wind; they land, drop their wings, find a mate to become king and queen and form a new colony. The “alates” do this every spring or summer because their colony gets over crowded and they search to start a new. Liquid termiticides are usually applied completely around and underneath a structure covering all areas where termites might gain access. For new construction, this is accomplished by treating the graded soil before the slab is pored. For an existing building, the perimeter of the foundation is trenched and drilled then treated with termiticide. The goal of the treatment is to put a chemical barrier between the termites in the soil and the structure above. The chemical barrier can also affect those termites inside a building by preventing their return to the soil. In many cases these termites will die of dehydration. There are advantages and disadvantage to repellent termiticides. 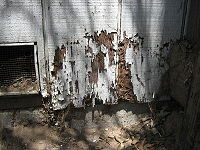 One advantage is that a complete barrier will effectively keep termites from coming into the structure. Also, the pyrethroids used for these barriers are relatively inexpensive and last for years. The disadvantages is that termites are able to detect these termiticide barrier in the soil and avoid lethal contact with them. This is important because applying a perfect barrier under a fully constructed house is very difficult. Construction features, plumbing lines, and landscaping are just a few of the obstacles that hinder liquid termiticide application. Because of these difficulties, there are often gaps in the treatment where the termiticide was not applied completely. Eventually, foraging termites may locate these gaps and gain access into the structure. If these termites find the structural wood, they will tunnel back through the untreated gap and recruit other termites into the building. 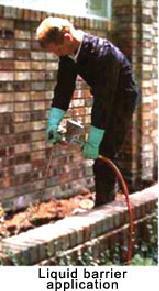 There are two non-repellent termiticide treatments available on the commercial market. Both are nerve poisons like pyrethroids, but they attack different sites of the nerve. These chemicals are not repellant and termites cannot detect them in the soil. Therefore, the termites tunnel into the termiticide while foraging, contact the chemical, and die. Premise(Bayer Corporation) contains the active ingredient imidocloprid. Imidocloprid is unique because it not only kills termites that contact a lethal dose, but it also kills them in doses too small to cause immediate death. If a termite contacts even a very small amount of imidocloprid it will become lethargic and forget to eat and feed other termites. It will also forget to groom itself so it soon becomes infested with soil fungi. The termite eventually dies as a result of these indirect symptoms of imidocloprid exposure. A disadvantage to Premise is that it is somewhat more expensive than the pyrethroid termiticide. 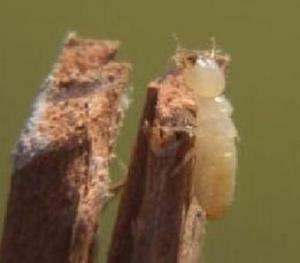 Subterranean termites feed exclusively on wood materials and have strict moisture requirements. With these characteristics in mind, a lot can be done to prevent an infestation by eliminating the food and moisture resource in their environment. Repair structural and plumbing leaks. Pull all mulch and landscaping back at least 6 inches from the foundation. Remove piles of trash and debris from around the home. Keep firewood stacked away from the structure. Make sure downspouts are long enough to direct water away from the foundation. Avoid direct wood to ground contact when building porches or decks. If your having moisture problems or evidence of mold please visit of sister site Guardian-Construction.com for information.